On June 2, Kiehl’s Since 1851 will install 13 very specially designed versions of our icon Mr. Bones in our New York-area stores. 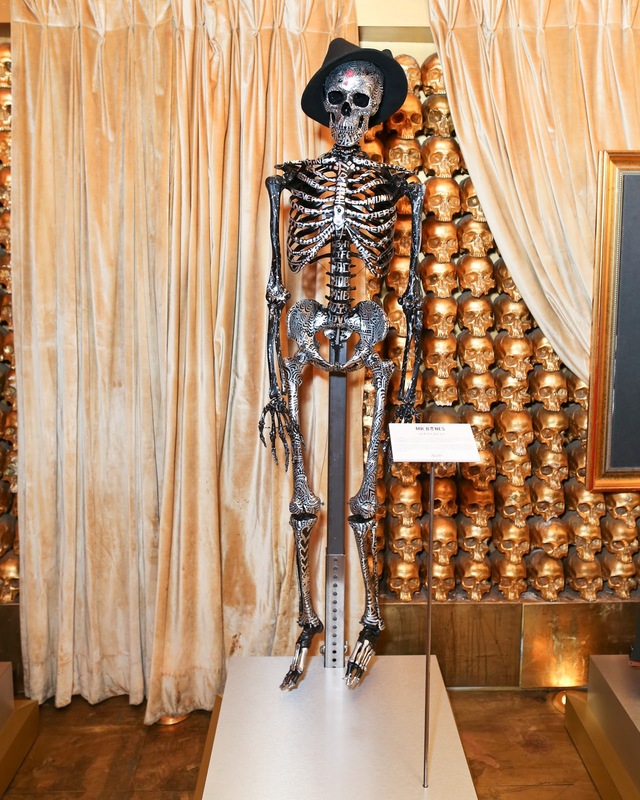 Encompassing celebrity partners, a charitable donation, and customer interaction, the Meet Mr. Bones project serves to engage and entertain all of our customers. Kiehl's is one of my favorite shops and their products represent high quality and amazing results. This Mr. Bones campaign is a fun one that teaches as well as raises money for various charities. Meet Mr. Bones honors Kiehl’s icon, Mr. Bones, the life-size teaching skeleton that holds a place of honor in all of our stores, as it is a part of our apothecary legacy—back when Kiehl’s was still a pharmacy, Mr. Aaron Morse, pharmacist and Kiehl’s founding father, would use a teaching skeleton to explain ailments and prescribe different remedies to his customers. This spring, Kiehl’s celebrates our own icon by partnering with 13 icons in their own right for our first public art installation. Each of our partners was given free rein to design and build his or her own Mr. Bones, and each will be on display for six weeks at the seven New York metro-area Kiehl’s stores, June 2 through July 14th. For their participation in the project, $200,000 will be donated to organizations supporting Children, the Environment, and HIV/AIDS causes worldwide that were chosen by our partners. And, at the end of 2012, each of these Mr. Bones will be auctioned off to further benefit each charity. Beginning June 2, not only will the public be able to view all 13 of the Mr. Bones throughout the NY area, but we’re also launching an in-store and digital extravaganza where our guests can learn more about the project, and enter to win one of 206 prizes, one for every bone in the skeleton! · IN OUR STORES: Visitors who participate in a complimentary skin care consultation or 20-minute facial, or make a purchase at Kiehl’s New York metro-area stores will get a chance to win prizes including Kiehl’s gift cards (valued from $25 to $500) and full-size Kiehl’s products, T-shirts, and even a dermatologist visit with Kiehl’s consulting dermatologist Dr. Adam Geyer. To enter to win, guests will get to choose a Kiehl’s packette sample out of a box, and if it’s specially marked to win, they’ll win a prize! · IN OUR STORES VIA TWITTER: Visitors who Tweet their check in or photo of Mr. Bones from any retail store and include #MrBones and #KiehlsGives, can win prizes that include a $500 Kiehl’s gift card. Kiehls Twitter can be found HERE. · ON FACEBOOK: Visitors to Kiehl’s Facebook page will be able to personalize and style their own Mr. Bones, save it to the Kiehl’s gallery, and enter to win prizes including a $1,000 Kiehl’s gift card. Your personalized Mr. Bones can also be saved and shared on your personal Facebook page. I would highly suggest if you are near any one of their stores, to pop in and enjoy some of these works of art. A free facial or skin care consult with the Kiehl's staff is a great way to pamper yourself with their fabulous products!! thanks for this terrific post .. the Columbus Avenue store is not far from me .. I will be wandering down there later .. I just love their products and this is a great idea to teach us about our bones and what they do! I am sure you will enjoy it! Enjoy the day! !